This is somewhat of a scaled-down, cheaters’ version. I’ll soon post the street vendors’ version with both the marinade and the grilling sauce which would be more appropriate for pork or beef satay. I hope this will tide you over until then. It’s a quick recipe, but delicious nonetheless. Mix the shrimp and following six ingredients together. Pan-grill the shrimp (you can go free-style or thread the shrimp on bamboo skewers like I did here) until cooked. ok here I am without any of moms peanut sauce – I better get on it! your shrimp looks like its cooked perfect. I love shrimp and great that your mum passed on her recipes to you. Mine won’t part with hers! Satay shrimp looks delicious. Clever way to use up those lonely little guys! 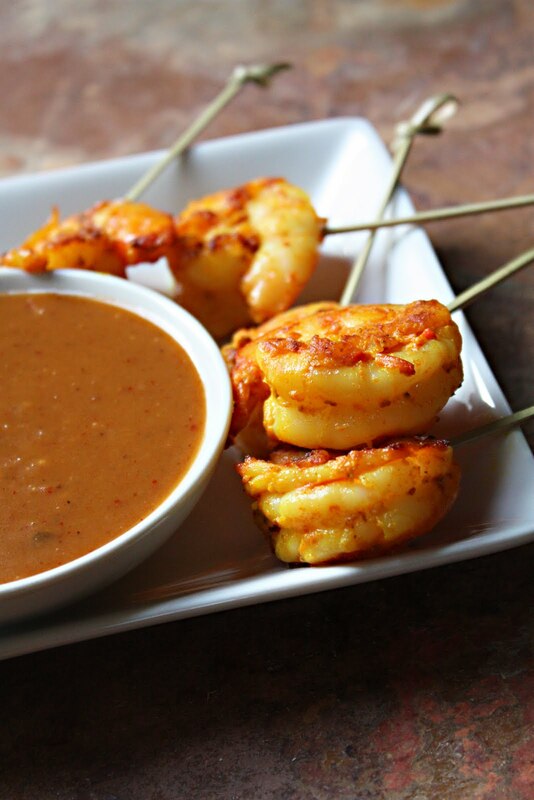 Your shrimp satay look lovely! I never seem to find cool stuff like this in the fridge. Tres sad, I know. Of course, the grocery store has shirmp, and I have everything else, including some of that awesome peanut sauce. I made it and it was very faboosh! So funny! You took those 6 shrimp farther than they ever thought they’d go. Yum. What happened to the other two shrimpies? LOL. Either way…yummy satay. I’ve got to try that peanut sauce. This looks wonderful! You’ve given me another idea as to what to do with my shrimp on the bbq. Love your blog, by the way. I can’t eat too much shrimp (one piece only and then my skin starts to itch). But, love peanut sauce, so I’ll have to find some other satay stuff for this. Its so great you have your mom’s cookbooks and her notes. My mother doesn’t use a recipe for anything so I have to watch and cook with her. OH MY…this shrimp look fab! We love satay but I’ve never made it! I always have shrimp in the freezer, it’s a staple! I love satay and of course the peanut sauce goes without question. To Jenn’s point your frugalness brings to mind another biblical story with the loaves and fishes. Maybe a dish with nigella is in order. Those shrimp look delicious! I can almost taste the spice encrusted on the outside! “My kids” made this for mother’s day last night but I didn’t have ground coriander, so I used fresh coriander. They didn’t quite look like yours but with the YUMMY peanut sauce, they were delicious!! Thanks for sharing! Love the photos , they look amazingly handsome. Suzy – There’s a link to the peanut sauce at the end of the post, the second to last line. That shrimp looks really good! The mix tasted too tumericky (excuse my language abuse) and grainy before I used it, which worried me. I added a little salt because I thought it needed it – then decided not to mess with it any further, and to just trust you. I grilled about 2 lbs of shrimp, and served them to three adults and two kids with your Mom’s great peanut satay sauce on Saturday, as an appetizer. The shrimp vanished so fast! Everybody loved them, and nobody objected to the heat of the satay, which is something I worry about when hosting people who are not used to spicy food (the tumeric powder was fine once it cooked). My advice is: overestimate the appetite of your guests, because they will want lots of these shrimp and lots of the sauce too. This recipe tasted fantastic, but I’m pretty sure now that I did it wrong! When I saw “mix all the ingredients” I threw in the peanut sauce, too, and wondered at my soupy concoction. Oh well, it turned out great in the end. Halie – Yikes. Sorry. The instructions are indeed misleading. Let me fix it. Thanks. What can one do with the “tail” of the coconut milk after using the cream part for the marinade? Dont want to waste it. anonymous – Many non-curry, savory applications that call for coconut milk. Tom Kha Gai is one of them. Today I tried the satay with your great peanut sauce. I used chicken and marinated it as instructed, but the chicken tasted pretty bitter after being grilled.. I’m afraid it was the turmeric but not quite sure. The peanut sauce was great but pretty thick, not sure if it supposed to be like that? Anon – Possible. ground turmeric tends to be more bitter than fresh, especially when it’s freshly ground and potent. Try reducing it by half to see of it works better. How I wish I could stake cooking classes from you!